book,” it is the first and last word on the subject. Fish is available for $30 + shipping from Carol Joy Cole: cjc@tir.com. White on roll; cube action? 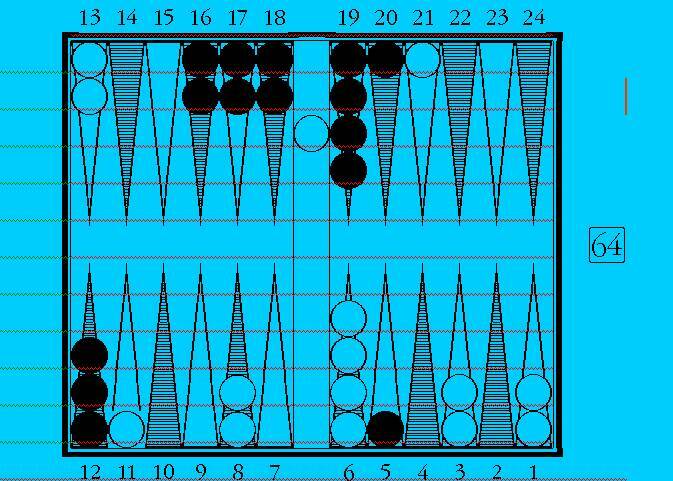 Barclay (Cooke) recommends that: a beginner double if playing an expert; an expert not double a beginner unless sure he’ll drop; that regardless of skill, for money this is double/take; finally, at 11-11 in a 15-point match, this is double/drop no matter who is playing. I agree with Barclay that an expert should only double if convinced his opponent will drop. Otherwise, I think doubling by anyone, at anytime, would be the greatest blunder since the Herschel Walker trade.